"After an in depth research and testing the quality of ​several water cooler models from different brands, we picked the best one for your home and office." The Whirlpool Self Cleaning, Hot, and Cold, Stainless Bottom Load Water Cooler is the best water cooler dispenser, that equipped with all the key features, which should be present in a quality water cooler. It has a built-in self cleaning technology that ensures water safety, a child safety feature, as well as the hot & cold feature that ensure optimum temperature. It is also easy to use and maintain. Read more details. For a budget friendly option, the Whirlpool Commercial Water Cooler is the best for most people. It features ultra quite operation, child friendly design and reasonable water dispensing speed. It was only a few years back that getting thirsty and in need of one, or a few glasses of water meant searching up and down for a faucet, wherever you are. Things have changed, and we can now wish for nothing more with the best water cooler dispenser. It’s quite pleasurable getting to choose between the hot and cold water. Water coolers come with different features that make life at home or office easier for you and others – you know how much dehydration can put us down. How Did We Analyze The Top 10 Water Cooler? How to Clean & Maintain A Water Cooler? To come up with the list of the Top Rated Water Coolers, we took an extra mile and tested several machines from Top 9 most popular and best water dispenser brand. We looked at the features, the make, brand and what customers were saying about them – we did our homework, don’t you think? There are so many reasons behind the top choice.This water cooler has all the best features and quality to be number one. In this bottom loading water dispenser review, we will inform you about those features and reasons to have this water cooler in your home or office. The first thing you notice is the appealing aluminum construction, of whirlpool self cleaning water dispenser has. It is something that adds a particular kind of appeal to your office or house. The smooth surface is not only appealing but also easy to clean. All you need is a damp cloth dipped in soapy water and used it to wipe the surface. And to ensure safe and clean water, the machine employs a self-cleaning technology. Specifically, it utilizes unstable oxygen technology to kill the harmful little fellas that love swimming in your water – the bacteria and viruses. It also has LED indicator lights that informs you of the self-cleaning process and when the water is at optimum temperature. Another good things about this Whirlpool 8liech sc ssf p5w model is that, it has 8 ½ inches tall filling area, that allows you to fill tall water bottle or sports bottle. However, you can gain additional 2 inches space by removing the drip tray. The unit has a switchable light at the top of the dispensing area for refilling water at night. It's a nice addition which you will love to use. It's one of the best bottom loading water dispenser available in the market, that can accommodates 2 ,4 or 5 gallon of water jar, since there are sufficient room where the jar goes. I personally own this water cooler and I really love to use it. The water taste great, no awful plastic taste whatsoever. The cold water is perfect to make chilled drinks. I usually use the hot water to make tea, coffee, hot chocolate etc. Moreover, It is extremely well-built and has a perfect size that aligns in my standard kitchen corner. If you are searching for a best water cooler for home then you will not go wrong by selecting this water cooler. An appealing water cooler with aluminum construction. Smooth and easy to clean surface. A self-cleaning technology to break down microorganisms and make the water safe. Can produce sufficiently hot water for a cup of tea or coffee. It is easy to use and maintain – a bottom loader. The hot water lock feature ensures toddler safety. Easily accommodates shorter container as the suction mechanism is adjustable. Indicator light for empty jar. Adequate filling area to refill personal bottles, travel mugs and tall glasses. Does not purify water, and so cannot add tap water. It makes a bit of noise when cleaning. No room temperature option available. Check out our 4th selection, in this regard. 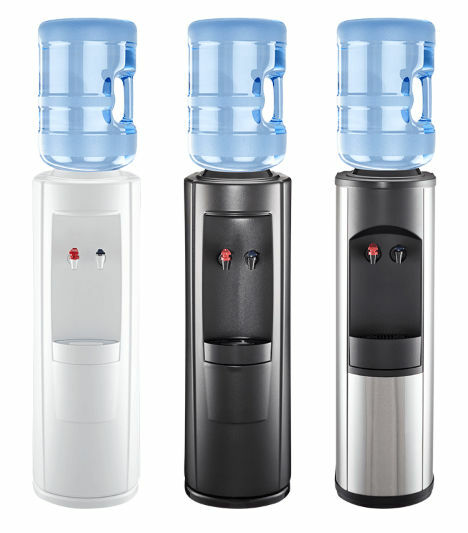 The “Avalon limited edition self-cleaning water cooler” is a popular model that has received lot's of appreciation from the user because of its unique features and elegant outlook. For starters, this bottom loading water cooler has an innovative design of durable stainless steel construction that adds much style in your home or office. We were impressed by its self-cleaning feature that prevents the accumulation of bacteria inside the unit. This feature also ensures that you will not have to clean the unit frequently, since the self- cleaning function will do the job for you. To give you the best drinking experience, this water cooler produces sufficient Hot(180° F) and Cold Water(47° F). However, there is an option to turn off the Hot water heater to save energy, when not in use. In addition to the Hot & Cold function, this water cooler has a room temperature function, ideal for cooking. As like our first selection, this cooler also has a child safety lock with the hot water dispenser spout to ensure child’s safety. But, is it ease to use? Well, the unit equipped with easy to use push button that makes it convenient to use. Additionally, the long dispensing area allows you to comfortably refill taller cups and water bottles. The unit is also features a removable drip tray to prevent the spillage of water. For the added convenience of user, this UL listed water cooler has a switchable nightlight which makes the spouts visible for refilling water at night. We really like this amazing feature of Avalon Limited Edition. Push buttons for easy water refill. Might have weird smell in chilling water. Avalon is a top brand and can be sure of a high-quality dispenser, but is Avalon Top Loading Water Cooler Dispenser, deserving of the title? For starters, its water is sufficiently hot, to make that refreshing cup of tea/coffee or instant soup, before you head out to face what awaits you. But you also have the option of having icy water, ideal for those hot summer days. Faster water dispensing, is another cool feature of this water cooler. It can fill up a 12Oz glass within 8-10 seconds. This feature will save your time for sure. A water dispenser should be easy to use for anyone without exceptions, and this is what this product is all about. It carries a removable drip tray at the bottom to prevent spills of water. As like our second best selection, this top loading water cooler also has sufficient water dispensing area (measures 9x3.25x10 inches), to refill most large cups and bottles without any hassle. It has a child lock ensuring that your children are safe, when not around to watch them. But is it energy efficient? Well, being energy star approved means that it will not use a significant amount of energy. Therefore acquiring this device will not mean more bills to pay. This water dispenser carries a stylish slim design. No matter the kind of decor and furniture you have in your living room, kitchen or office, the machine does not look out of place. It's one of the best top loading water dispenser for home and office use, which is available in three different colors in the market right now. A shortcoming of this unit is that, it's a top loader and little bit higher than it's peers. Therefore, this could be an issue for short people to lift the jar up high enough to put it on top. A top quality dispenser from a top brand. Gives out hot water that you can use for a cup of coffee and sufficiently cold water for making smoothies. Child safety feature for the hot water. Removable drip tray at the bottom. It can hold 3 to 5 gallon water jar. Lightweight; Easy to move around. It is top loading and refills may be quite hard to manage. May have leaking problems, with time. If you're looking for a water cooler unit that only does room temperature and cold water, then this is for you. It features high-grade stainless steel which adds to the first appeal, as well as, durability. You can have the attractive view of the stainless steel surface from any angle – it is something that your guests will appreciate. The whirlpool water dispenser is among the few we can comfortably refer to as reliable. It can consistently produce room temperature, as well as, cold water( 45 °F ). In fact, the water cooler keeps the water 9°F degrees colder than its peers – we can talk about a high performing device. One of the absolute best feature of this water cooler is it's long water dispensing area ,that allows you to comfortably refill sports water bottle and reusable water bottle from the unit. Moreover, the water cooler is economical on power consumption, since the compressor turn on less frequently. Such a feature also increases compressor life span. The quality of this water dispenser is a level above the rest. It easily outlasts its peers and boasts a solid steel frame, that can withstand hundreds of pounds of top pressure. It is, therefore, something that you are going to use for years to come. This water cooler unit is decent but not free from flaws. For starter, It's shorter( measures 36 inches only) than the counterparts. So, this could be an issue for tall people to refill water from the dispensing area. Although, such a design is great for loading water jar from the top since it's a top loader. Produces ice-chilled and room temperature water . High-grade stainless steel surface for durability and attractiveness. It is quite long-lasting and will easily outlast its peers. Compact design, that fits easily in apartment sized kitchens. Water dispenses in a reasonable speed. A top loader and it is difficult to refill. There might have limited space in your kitchen or office, but that doesn’t mean you can’t have a water cooler dispenser. The following water cooler from Avalon will be your best option which does not occupy much space and can be situated anywhere you want. And that is one of the best selling point of this unit. It is a bottle less water dispenser meaning that, there is no need to use any kind of bottled water. Even, you will not have to worry about running out of water since, it will be plumbed directly into a water line of your home or office - Quiet impressive. This 3 temperature self-cleaning water cooler is a best choice for those who wants to have instant access of hot as well as cold water. It carries two separate stainless steel tank for holding hot and cold water separately. The stainless steel tank can hold up to 1 liter of hot water and 3 liter of cold water. The countertop bottleless water cooler features a dual stage water filtration system that ensures water safety. These multi-layer water filtration system can efficiently remove bad odor and harmful contamination from your water. Thus, you will get pure and delicious drinking water. The water cooler is incredibly cost effective. You don’t have to pay extra money in buying water bottles and paying monthly bottle delivery fee. We really like the filter cartridge which is quiet long lasting. You only have to change the filter twice in a year. The installation of the unit is not rocket science. You can easily install it by following the manual. The unit comes complete with all the necessary installation kits. The unit is lightweight and portable. Eco- friendly since there is no use of bottled water. The installation might be difficult for the first time. The best thing about this Hamilton Beach equipment is that it is a bottom loader. That means easy water refills since you will not need to lift anything – especially ideal for people those haven’t the energy to lift. Hamilton Beach BL-1-4A water cooler maintains the water at room temperature, hot and cold. You can choose your ideal temperature according to your preferences. Basically, room temperature option is great for people that have sensitive teeth. It functioned perfectly to dispense steaming hot water and icy cold water. You can make tea, coffee or soup with the hot water. However, if you don't like to use the hot water function frequently, then there is an option to turn off the heating by the switch in the back. A best hot and cold water dispenser should be easy to use. This water cooler equipped with push buttons at the top surface of the unit instead of levers. Such a design ensure fast and easy water refilling. A child safety lock on the hot water button ensures that, any toddler in your home is safe – we can never be too careful. This bottom load water dispenser also comes with a flashing indicator light, when the bottle requires replacing – quite convenient. A bottom loading water cooler for easier refilling. Push button controls, which is quite easy to operate. Can maintain the water at room temperature, as well as, hot and cold. It Comes with a removable drip tray to keep the place as dry as you need it to be. It can accommodates 3 and 5 gallon water bottle. Room temperature setting is 10 degrees cooler than room temperature. Adequate water pressure from the spouts. It sometimes vibrates, making a bit of noise.You can fix it by placing a small foam between the unit's body and the metal tubing behind it. The top loading water dispenser has some of the features to make anyone happy. Well, for starters, the water cooler has one of those designs that add some attraction in your living room. It has a sturdy construction to hold up to five gallons container, easily. But some of the most important features include the energy-saving feature – you no longer have to grumble about the rising cost of water. It features a heat efficiency, and thermo-electric cooling engineering to ensure you are making savings, regarding power compared to other comparable equipment on the market. And unlike other water coolers, it has a bottom cabinet for additional storage. You can put some of the cups, and other utensils here for easier access. An appealing and sturdy design. Has sufficient strength to hold up to five gallons. A high level of energy efficiency. Comes with a bottom cabinet for additional storage space. Produces low noise that you can comfortably concentrate on your work. Child safety for the hot water. A top-loading variety that will prove challenging to handle refills, for some people. May have a bit of plastic taste. Little low. You've to bend down to pour water into a glass from the spout. Whether you have a craving for a toasty beverage or cold refreshment, this is the right machine for that. You can get water up to 57 degrees Fahrenheit cold water or 203 degrees Fahrenheit hot water – quite adequate for your needs. And to make it easier for you, Nutrichef Countertop Water Cooler Dispenser comes with an automatic system for quick heating of the water. It also has an ultra-quiet operation, sufficient so that you can comfortably read a book, or do something else while the machine is running. The countertop water dispenser comes with an innovative tabletop design, fitting for your home, or office. That means, you do not have to worry about inadequate floor space in your kitchen or office to place a water cooler. For the safety of children at home, the Nutrichef water dispenser comes with a child safety lock – a must have if you have a baby around. Produces adequately cold and hot water for your needs. It can accommodate five gallons of water. Has an automatic system for quick water cooling. An attractive and innovative tabletop design. May have a plastic taste. There may be leaking problems with this device. The highlight feature of primo bottom load self cleaning water dispenser is the fact that it can accommodate various bottle shapes. You no longer need to run from one store to the next searching for a particular form – quite convenient to say the least. Another good things about this water dispenser is that, it has a Self-Sanitizing feature that can sanitize water reservoirs and lines. No manual work needed. The water reservoirs is made from stainless steel which ensure it's durability. The unit equipped with push button with three temperature setting options to help you get water for multi purpose use like- hot drinks, cold beverages or warm meals. But we cannot forget the easy to operate benefit – many primo water dispenser reviews underscore this. Anyone can pour themselves a refreshing cup of water. The machine does not use a significant amount of power – energy star-qualified. You will no longer have to scream at the strange power bills. Primo water dispenser has a dishwasher-safe drip tray that is easy to clean. The water cooler also looks okay regarding design, and size – it will comfortably fit at the corner you want it. Although the water dispenser referred as one of the best rated water dispenser in the market right, now but it's not free from few shortcomings. For example, the dispensing area is not long enough to fit tall water bottles or sports bottles. Some users have complained that the water cooler has leaking problem. You can use any shape of jug or bottle – quite convenient. It is a breeze to use this machine. Compact enough to fit the corner you’ve reserving. The dispensing area is shorter than it's peers. The quality of the plastic is not the best. Another water dispenser you would want to have at home or office. But what is this about it that sets it apart from the pack? For starters, this free standing water dispenser has conventional heating and cooling capacity. It possibly heats four liters every hour to above 194 degrees Fahrenheit. The cooling capacity is about 2 liters every hour below 50 degrees F. This magnificent water cooler can significantly improve your water taste, because the water tank is made of high-quality stainless steel. It is also among the safest, and most straightforward of devices to use. The drip tray is easy to remove, and clean – quite valuable. And to make it even easier to move, the water cooler comes with back handles. It features a mechanical "push-in faucets", another feature that makes it so convenient to use. Many Honeywell water dispenser reviews underscore this unique feature. Another good things about this water dispenser is that, it has a storage area where you can put smaller cups, tea bags, cocoa any many more related accessories. The product is safe with the child lock, and the relevant certification – ETL certified. The certification means that the device has the approval of the relevant bodies on safety matters. Suitable heating and cooling rate . It is safe and comfortable to use. Easy to remove, drip tray. A back handle for more comfortable movement. Comes with a child safety lock. Extra Storage capacity (Cup Holder). Available in 3 different color. It is a bit loud for comfort. Setting up may not be a walk in the park. While most of the top drains create a mess all over the floor when it comes to refilling, this product is useful in that regard. It comes with a spike that creates a clean outlet on the jug. The water cooler also provides hot beverages and cold drinks depending on preference. The good thing about energy star-approved devices is that they are economical when it comes to using electricity. And like the majority of other devices in this list, NewAir WCD-200W Hot and Cold Water Cooler feature a child safety lock, to prevent the young lads from getting to the hot water. The device is also among those we can refer to as, reliable. It provides the kind of water you need – hot or cold – any time, and at the right amount. Does not create a mess when refilling. Lets you choose between cold, and hot water. Provides boiling water for a steaming cup of coffee. Still, you need muscle strength to refill. It is not the most durable of water coolers. May leak after a short time. The Honeywell water dispenser comes with a stainless steel tank to provide clean drinking water. Through the push in tap system, you can get water at the right temperature and at any time. The compressor cooling has a heating capacity of 5 liters every hour and it can heat up to 194 degrees. You can enjoy hot coffee, hot tea or hot instant cereal without a hassle. You must be very careful since the hot water could get very hot but the system comes with a child safety lock. The cooling capacity stands at 2 liters per hours and it can cool up to 50 degrees. The machine is 13 inches wide and 14 inches tall and has a white finish. To prevent spills, the dispenser has a funnel with a prong to support bottles with spill proof caps. You can use 3 and 5-gallon water bottles on the dispenser. The water cooler is ETL certified and it has a storage space at the base. Cleaning should not be a problem since the 85-watt water cooler has a removable drip tray for convenience while cleaning. The dispenser is white in color and blends with your surroundings. It has an additional storage at the bottom which is an added advantage. You could store cups, glasses, and bottles to avoid clutter in the dispenser area. The dispenser supports 5-gallon water bottles with no issues and it does not make a peep and spill. Under the spout, there is enough space to stand a water bottle without holding it. If you store water in the fridge for cooling, the Honeywell water dispenser will save you a lot of valuable space. The water cooler ensures you get cold water any time you want and you don’t have to stress. The dispenser’s filtration system gets rid of bacteria, chlorine and other impurities that sneak into the water. The water is healthier to drink. At first, the water has a metallic taste that could be irritating to some users. In some cases, the water has a taste of plastic. The taste could be strong initially but after some time, it fades away. If the taste persists, you should adjust the thermostat. You should get rid of the sticker at the back indicating ‘do not adjust’ and turn it 45 degrees clockwise. The Genuine Joe water cooler is one attractive water cooler that looks like a small exotic cabinet – it’s appealing to have in your living room. The 50lbs water cooler comes with the necessary features you would expect from a quality water cooler. It dispenses three kinds of water, and you only need to choose the one you prefer – there is hot, cold and room temperature water. The dispenser also features the availability indicator light for smoother operation. You can easily choose between hot, cold and room temperature water. A removable and easy to clean drip tray. Makes a significant amount of noise. May leak water after a period of use. The name tells you what they are and what they do. A water cooler is a machine that enables you to get cold drinking water. Basically, it cools the water temperature by utilizing an electric compressor. Beside, they also provide boiling water to make that refreshing cup of coffee or tea, after a hard day at work. Once they were used in offices, hotels, boardrooms, but at present they are becoming popular at home and cottages. On the other hand, A water dispenser only dispense water at room temperature. They draw water from a container and dispense via a spouts. There are mainly four different varieties of water coolers available in the market right now. They all function in a different way and have their own features. Let's discuss them in details. The bottom loaders are more comfortable to use and do not require significant physical strength to refill. All you need is roll the water container to where the dispenser is and push it inside. You then put the suction and pipes back in place, close the door, and you are now ready to start having glasses of water. But there is a different story with top loading water coolers. Typically, you will need to boast a significant amount of muscle power to lift and flip the water container on top of the machine. Regardless, the top loaders are the most common in offices – they have been part of many offices for decades. As the name suggests, there is no need to use any kind of water jar to get water from these water dispenser unit. This type of water cooler also commonly referred to as bottle free water cooler or POU ( Point Of Use ) water cooler dispenser. Basically, a bottle less water cooler, can be situated anywhere you need drinking water, as long as there is an electrical outlet close by and a water source in your building. Most of these water cooler come complete with installation kits and a water filter system , to give you pure and great tasting water. The bottle less water dispenser are more expensive than its counterpart. But, the fact is, these are incredibly cost effective in the long run since, you will not have to buy bottled water anymore. The installation of bottle free water dispenser is little bit challenging for the first time. You need to call a professional to install it for you. But, once it gets set, you will enjoy refreshing water for a long period of time without worrying about changing or lifting the jar. Bottle less water cooler dispenser are becoming more popular in professional offices, hospitals and schools now a days, for their elegant design and hassle free use. A countertop water cooler can be placed anywhere you want, weather on a table or a kitchen counter. They are portable and require minimum space than it's counterparts. They are also budget friendly. The downside of a countertop water cooler is that, they are equipped with smaller compressor than the traditional full-size dispenser. Hence, you might not get water as cold as freestanding models. But, at the end of the day, a countertop water dispenser will reduce your electricity bill since, the compressor will consume minimum electricity. What types of water cooler should i get? The choice among the four kinds of water cooler is down to personal preference. You will have to determine which is more convenient – the majority of us know which dispenser is most appropriate, but who are we to stand in the way of an individual that wants to demonstrate some muscle power? Before selecting a water cooler you should consider some key factors. The following water cooler buying guide will analyze those key factors and lead you to the best water dispenser. This is definitely, among the most critical of factors. Mostly, the water coolers will be holding both hot and cold water. It, therefore, goes without saying that it must demonstrate marked sturdiness to withstand the different temperatures. Some water dispensers contain industrial-grade stainless steel, to ensure water does not come into contact with harmful microorganisms, such as bacteria, and which can make you ill. The stainless steel water cooler also eliminates the plastic taste in your drinking water. Water Dispensers should boast safety features. The hot water faucet should not pose any considerable burn risk to unattended children – you know how curious children can be? The construction should also demonstrate a high level of safety. For example, all materials used should be BPA-free and can lock harmful bacteria, and the like, away from the water. ​Ideally, water coolers should be easy to clean and maintain. They should not come with seemingly tricky parts that require technical expertise to handle. For example, some water dispensers only need the removal of the drip tray to clean. Anyone can do this without a problem. Some advanced models boast a self-cleaning, feature that prevents, and exterminate the harmful tiny bugs that may hide within your water. A stainless steel body is not only appealing but is very easy to clean. An ideal water cooler should be easy to use. No one fancies a hard to use the equipment. The children should not come running to you if they need a glass of water. But they should also be effortless to refill. There is some equipment with bottom loading feature for easy refills. This means wives never have to wait for their male partners to come and replace the empty jar. Before making a buying decision, check the measurement of the unit, Like- it's height, width and size of the water dispensing area etc. The water cooler should not be too high or low (standard height is 41 inches ). Also do make sure that, it has sufficient water dispensing area between the drip tray and faucet to refill tall water bottles, travel mugs, etc. effortlessly. If your drinking water contaminated with chlorine, bacteria, lead etc. then you should invest your money in a water cooler that equipped with best water filtering system. like- this one. This type of water cooler usually come with 1 or 2 stage of water filtration system to remove contaminants from water. No one wants an eyesore in their living room or front office. Ideally, the dispenser should be something attractive to look at. It should be something that compliments your decor, easily. People should not be afraid to fetch water from it – some dispensers with surfaces that easily stain, have many people preferring to drink water, elsewhere. The water cooler should be compact without seeming too bulky for the room. They should easily fit at one corner, not far away from the dining or living space. The dispenser that allows you to track the water level easily is best Like- this one. Preferably, you should choose water coolers with Drip Tray, that allow spillage-free refilling. It should make your task more comfortable, not harder by not needing to wipe the floor after every refill. There are few water cooler models available, that feature a "Cup Holder" where you can store cups, mugs, water bottles etc. You may consider this feature if you like to have additional space in your water cooler. Most of the water cooler can easily accommodate 2, 3, or 5 gallon of pre-filled water jar. Still, you should make sure about it before purchasing. Also make sure about the availability of water jar in your area. Avoid water cooler dispensers that are too cheap. It would not make any sense to buy a machine only to dispose of it after a month’s use. Too cheap, also means substandard and unsafe materials, likely to cause health issues. If you are not in the position to buy quality, no one said that you couldn’t wait a few months as you save for better equipment. Many people, too often overlook energy efficiency when purchasing equipment but it is as important as other features. Energy Star- approved water coolers mean that they are also energy efficient. Water dispensers should never form the bulk of your power overheads. It would not make any sense going for something that looks too big for the space you have. To avoid some of the embarrassing situations, determine if the space you have in your office or home is sufficient for the water cooler you are going to purchase. One tbsp of cleaning agents like- oxygen bleach, white vinegar. Paper towels to soak up spills. Step 1: Unplug the cooler from the electric socket. Step 2: Remove the water bottle from the cooler and drain all the water out of the cooler. Step 3: Mix the cleaning agent with water. The ratio should be: 1 tbsp for 1 gallon of water. Step 4: Wet a hand brush into the cleaning solution and wipe out the inner surface of the water cooler. Step 5: After that, remove the top part (inner surface) of the cooler. Step 6: Pour the cleaning solution into the inner reservoir of the water cooler and fill it up as much as possible. Let it stand for 4-5 minutes. Step 8: Lift off the drip tray and scrub with a hand brush. Step 9: Take a piece of paper towels and lightly dab into the solution. Now you’re cooler is ready to use. Re-install top of the cooler. Replace bottle and run clean water through the spigots. Watch the following Video to get more information. The best water cooler for home or office makes life a little bit easier, by providing the right kind of water you need, to quench your thirst. Several factors include safety, efficiency, and budget will guide you to the right machine. Depending on your preference you can choose either a top loading water cooler or a bottom loading machine – the choice is always yours. Does Whirlpool Self Cleaning Water Cooler filter water? I really like it’s self cleaning feature. No. It carries no filter to remove contamination from water. You must use bottled water. Yes, self-cleaning feature of Whirlpool water cooler is really cool. Thanks for the details review, Donna. It was really helpful, BTW, I always give preference to a bottle-less water cooler.